A powerful assault shuttle, the LAAT/i was deployed throughout all of the theatres of the Clone Wars to great effect. Normally the ship was protected by the bulk of the Assault Cruisers who would insert them near land based organization points, but the Battle of Muunilist showed the assembled Repbulic forces deploying them in space as they attempted to conquer the homeworld of the Intergalactic Banking Clan. 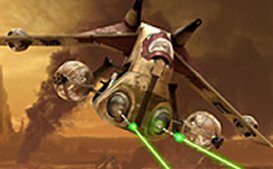 A modification to the Gunships toward the middle of the Clone Wars (approximately �20 ANH) allowed them to begin to be deployed from high orbit, launching directly into space. The LAAT/i is a truly fearsome gunship in its intended role of planetary assault, but it fares less well in space battles, due to a lack of thrust and its vulnerable flanks. However, it still performs well as a weapons platform, with multiple blaster turrets affording excellent fields of fire and four space to space rockets that are accurate and deadly against fighter craft.